Carte Generale des routes de poste de L'Europe Dressee d'apres les itineraires les plus nouveaux de chaque etats. 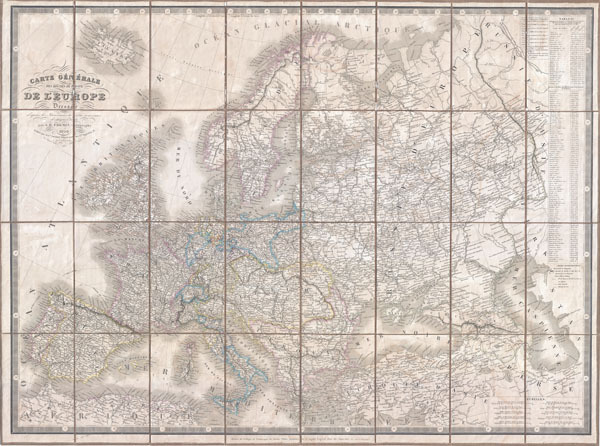 An extremely scarce 1844 postal map of Europe in case or pocket format by the French map publishers A. Logerot and A. R. Fremin. Details the whole of Europe noting thousands of towns, cities, and villages as well as the roads that connect them. Shows mileage for each section of road - an almost incomprehensible feat considering the vast area this map covers. Includes Iceland and shows shipping lanes throughout. Countries outlined in various pastels. Keyboard style border. All in all, a stunning map and a remarkable cartographic achievement. A. R. Fremin (fl. c. 1810 - c. 1860) was a French geographer active in the early to mid 19th century. He is known to have been a student of the cartographer Jean-Baptiste Poirson. Fremin drew and compiled maps for many prominent French cartographic publishers of the period including Tardieu, Logerot, Dufour, Monin, Duvotenay, Dyonnet, and Vuillemin. Little else is known of Fremin's life and work. Very good condition. Light overall toning. Dissected and mounted on linen in 24 panels.